Up to My Eyeballs in...!!! Cheerios...If I were to rename this blog...."Up to My Eyeballs in Cheerios" would be it! They are everywhere!!! 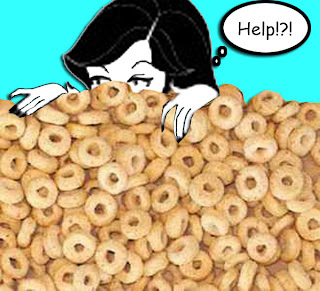 I am constantly on my knees picking up Cheerios...They are everywhere, under my feet, wedged in between the couch cusions, in the babies diapers....I think I have a Cheerio in my ear. "Well stop giving your kiddos Cheerios!" you ask? Then my children stand there in a loud, almost religious, yoga-esque chant.... "Ooooooohhhhhhs, ooooooohhhhhhsss, ooooooooosssssssssss!" I am up to my eyeballs in OOOOHHHHHSSSS! I relate! Up until our son was born I wasn't aware that cheerios actually shrink after time. Who knews. I find them in our couch, behind the couch and under the couch.